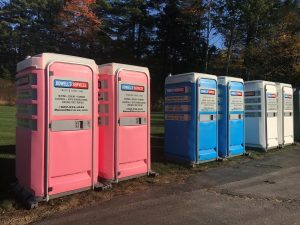 At Rowell’s Services, we are your source for clean, affordable portable toilet rentals in New Hampshire. Whether you need to rent a port-a-potty while your home is undergoing major plumbing renovations or you need to rent several toilets for a special event, we have what you’re looking for! We offer a complete range of temporary, portable restroom services for events and more. From the basic, standard portable toilet to models that flush and have lights inside, we have the perfect solution for your temporary restroom needs. We also carry handicap accessible rentals. …and more. Our port-a-potties are also commonly used on construction sites, campgrounds, etc. Anytime you need an outdoor bathroom, we can help. Portable toilet rentals provide an affordable alternative to traditional restrooms, and they are convenient. There is no risk of clogging and other plumbing issues, and they provide a means for sanitary waste removal. Many models also provide access to handwashing stations. At Rowell’s Services, we understand how important restroom facilities are at any event. When you choose us for your portable toilet rental needs, you can rest assured knowing that you will be provided with clean, effective units that will get the job done. Whether you need just one rental or several, we have you covered, and we offer daily, weekly, monthly and extended rentals. 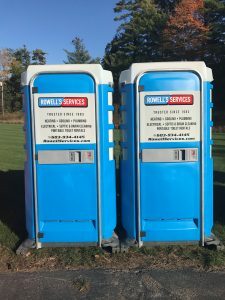 If you are in need of portable toilet rentals in New Hampshire, please contact Rowell’s Services for additional information. You can reach us by calling 603-934-4145.